I’ve been wanting to do something like this for years – and today, we’re finally making it happen. I’m nervous and stoked. I know that I should be blogging more, but I often find it hard to find the time or even work up the courage. And I’m going to bet that many of you are the same. 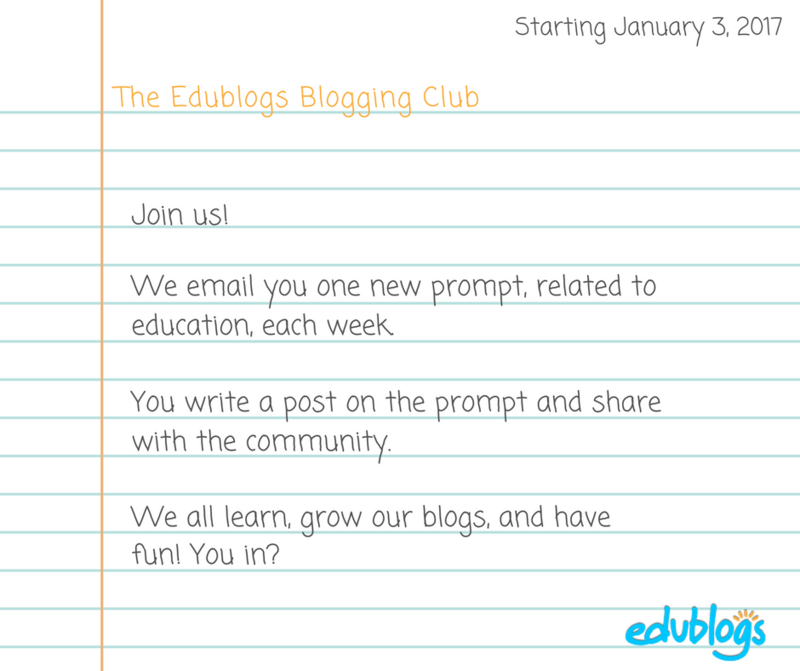 So, starting the first week of 2017, we will be publishing weekly blog prompts, related to education, and we want you to take part in this new blogging club! Geared towards educators, but open to everyone – on any blog platform – we’ve put together topics, tasks, and short projects that should interest all. We’ll try and model best practices in hopes that this may inspire how blogging can be encouraged with students too. Topics like classroom management, edtech tools, and student voice. Tasks like create a short video or embed. If you participate, this should be your best year of professional development yet. If this sounds interesting to you, we’ll publish the first prompt on Tuesday, January 3rd and then each Tuesday after that. For the entire year. We hope to build a community around the hashtag #EdublogsClub. You’ll be able to leave links to your posts here on this blog as well to help others find posts on topics that interests them. Getting started is easy – just complete this short Google form here. While we wait for the New Year to roll around, you can work through our free blogging challenge series to make sure your blog is ready to go. Here’s to blogging in 2017! Looks interesting, sign me up! Sounds fun. I am in. I’m intrigued! Great way to focus. Collaborate. Ok, put me down for that thanks.